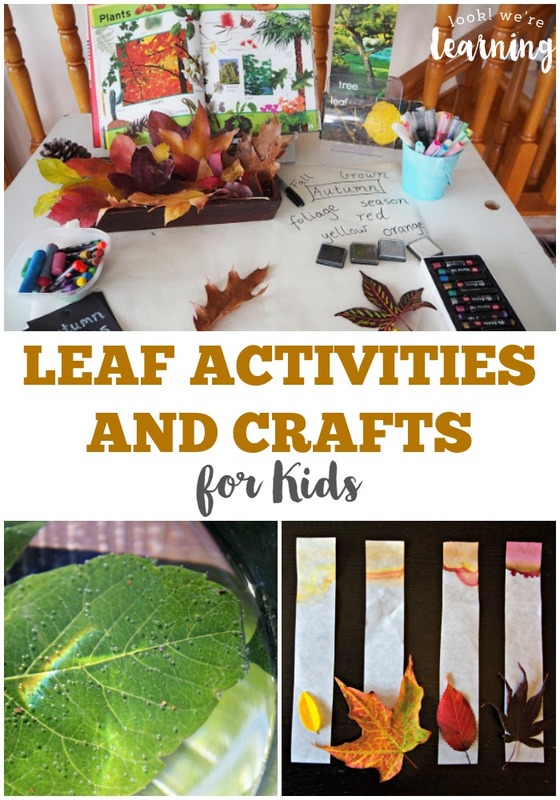 Leaf Activities for Kids - Look! We're Learning! We’ve made lots of leaf-themed activities before, including leaf flashcards, leaf garlands, and leaf snow globes. But you can never have too many leaf crafts! These leaf activities for kids are a beautiful way to start discovering the season with the family! 1. Have some art fun with this Leaf Painting for Kids activity! 2. Learn about the special features that make leaves turn colors with this Leaf Chromatography experiment! 3. Try this How Do Leaves Breathe Experiment to find out how leaves get carbon dioxide! 4. These lovely Negative Leaf Impressions are a simple way to add art into your fall unit! 5. Gather the prettiest leaves in the neighborhood and make this Preserved Leaf Mobile! 6. Hand your smallest one some of these Fall Leaf Stickers and let them decorate a gift box! 7. Download this All About Leaves Printable Pack to talk about science and language arts with leaves! 8. This Autumn Leaf Threading activity is perfect for preschoolers! 9. There aren’t a lot of nature crafts that take my breath away, but this Stick and Leaf Butterfly Craft is downright gorgeous! 10. Let the kids set up an Autumn Leaf Investigation Table to encourage open-ended exploration! 11. Use those old toilet rolls to make this beautiful Toilet Paper Roll Leaf Stamping Tree! 12. Help tots learn their colors with this Leaf Color Match for Toddlers! 13. Get a Maple Leaf Paper Punch and let the kids cut out leaf shapes! Thank you so much for including us! This is a fantastic resource!